Ah oui, la charcuterie. The term is nearly synonymous with Portland dining nowadays. 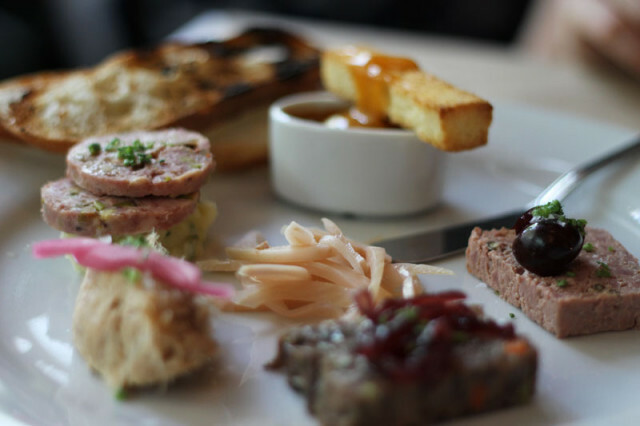 Every restaurant, from French bistro to American dive bar, is boasting its own boards of pates and terrines—or at least a few links of sausage from Olympic Provisions. To even be a part of the conversation means breaking through the salami case and stepping it up. And that’s what Little Bird has done. Head chef Erik Van Kley has been cranking out high-level bistro dishes like roasted marrow bones and duck confit since opening late last winter (with big expectations) under the wings of co-owner Gabriel Rucker of Le Pigeon fame. Then, Van Kley’s entry in the charcuterie sweepstakes consisted merely pork rillettes, foie mousse on toast, and a few Olympic Provision links. Now, Van Kley has stepped out with his own statement—creative, ambitious, and homemade, with as many as five options per plate, each with its own house pickles or jams. Every few weeks, his charcuterie takes on a new form. During a recent visit, truffle sausages riddled with pistachio atop a “potato salad” sat next to a geometric duck terrine crowned with a black, pickled cherry. But the star was the oxtail terrine, which tasted like the best brisket you could imagine—carnal and sweet, slathered in a dark burgundy onion compote. The foie gras brûlée with apricot sauternes jam was perhaps a bit too over-the-top, but the presentation impressed, as it arrived equipped with a log of brioche to break through the “brûlée”—a shell of crackling apricot covering a sub-glacial lake of rich, buttery foie gras. 1. Bring one more person to tackle Little Bird’s sizable menagerie of meats, or at least an extra dose of Lipitor…you’ll need it. 2. Order a glass of beaujolais or rosé (if it’s sunny) from Little Bird’s impressive wine list, and bam! You’re sailing on the Rhône in no time. 3. The board typically costs $17, but during happy hour (3-5pm), this early bird is a steal at $14.